Highest Reading Yet At Fukushima Reactor No. 3: 1.6 Sieverts Per Hour! Following up the previous post..
11/20/2011, Tepco announced they measured 1.6 Sv/h at reactor 3, which is the highest reading of reactor 3. 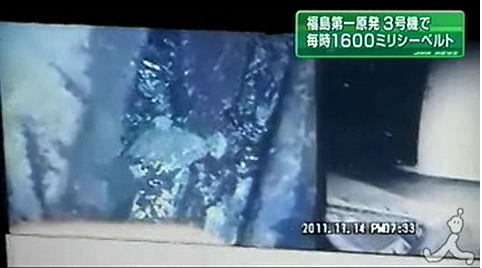 Since last week, Tepco has been measuring radiation in reactor 3 by using human worker to assist robot. 11/14/2011, when they washed off water on the floor and it was 1.32 Sv/h. Now they measured even higher radiation from the floor of the building. Tepco is supposed to declare that they managed to cold shut down the Fukushima plants by the end of this year, but actually, they don’t even know what is going on inside of the reactor.